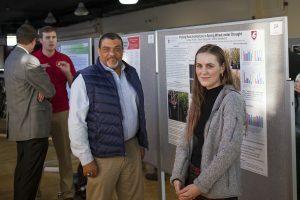 Scientists from around CAHNRS and WSU came together recently for the 2019 BIOAg Symposium on the WSU Pullman campus. Dean Wright poses with WSU graduate student Kathleen Hickey in front of her research poster. Hickey is a student in WSU’s Institute of Biological Chemistry. It featured a well-attended poster session and a panel discussion with Associate Professor Kevin Murphy of the WSU Department of Crop and Soil Sciences, and Professor and Vice Dean John Roll and Associate Professor Pablo Monsivais of the Elson S. Floyd College of Medicine. CAHNRS Dean André-Denis Wright attended, talking with several WSU scientists to learn about their research and their backgrounds. The poster session featured over a dozen research projects, ranging from organic fertilizer usage to irrigation methodology in vineyards to erosion vulnerability for the Columbia River Basin.